The last of the home grown rhubarb is coming this month, after that you need to let the plants rest and regroup. 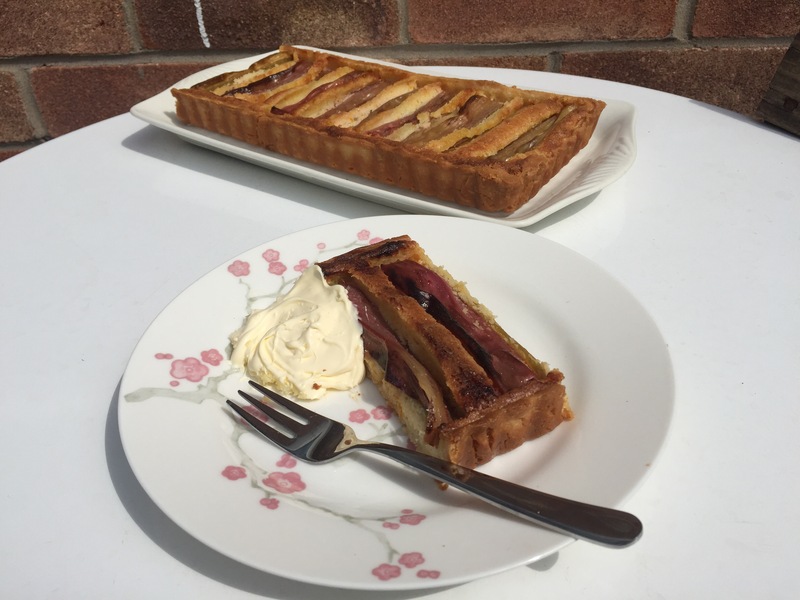 So I whipped up this Rhubarb and Orange Frangipane Tart to make the most of it while it’s still with us! The later season rhubarb isn’t as vibrantly coloured as the younger forced rhubarb you get at the beginning of the year, if you made it with that then this would really be a pink showstopper! However, the regimented rows of rhubarb are very pleasing to me and the taste is amazing! The natural tartness of the rhubarb and the sweetness of the orange frangipane go together so well and make a wonderfully refreshing tart that’s full of flavour. Heat the oven to gas mark 7 and grease your loose bottomed rectangular tart tin well. Press the pastry into the tin carefully, leaving a small overhang around the edge. 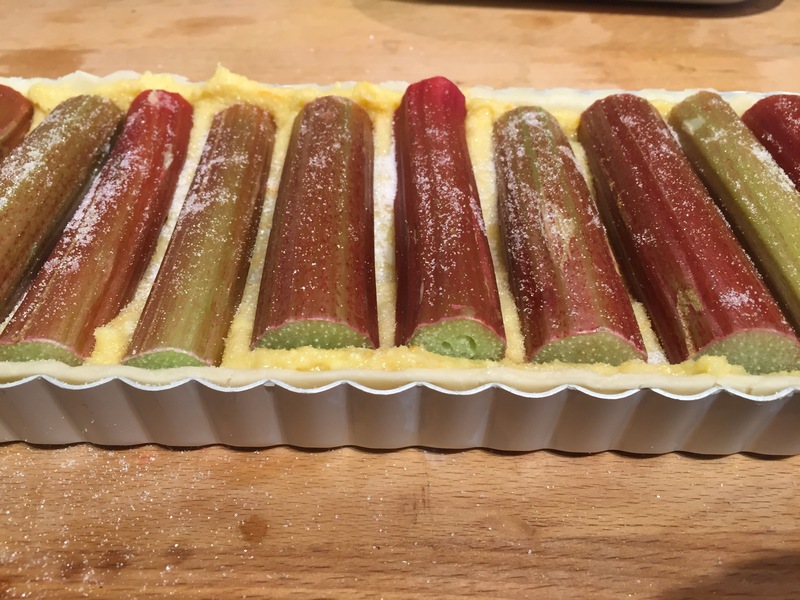 Slice your rhubarb into batons the width of the inside of the pastry shell. In a small mixing bowl combine the butter, sugar, egg, ground almonds and orange zest and beat until well combined and smooth. Scrape the frangipane mixture into the pastry. 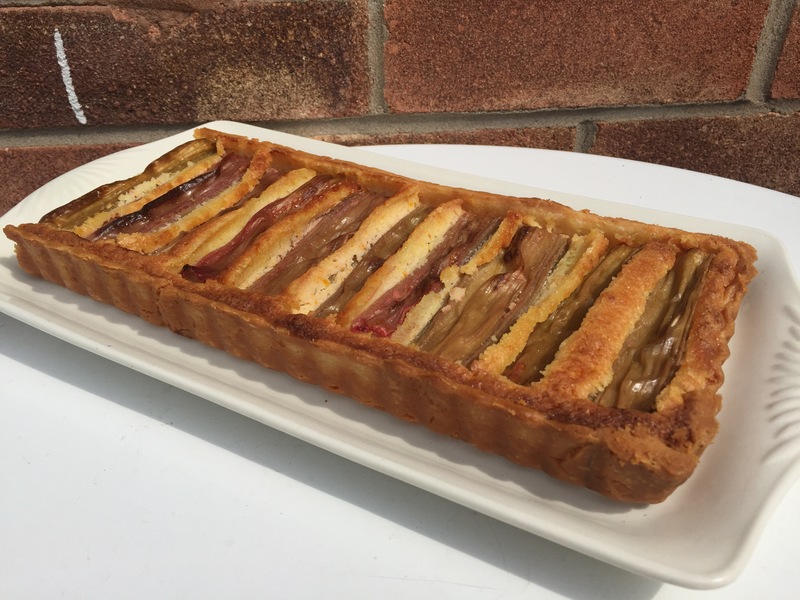 Place the rhubarb on top of the frangipane evenly. Sprinkle with the remaining 1 tbsp sugar. Bake for 30 minutes until the top of the frangipane is golden brown and the pastry an even colour. Remove from the oven and trim away the excess pastry from the edges with a sharp knife. Leave to cool completely in the tin then carefully unmould. Serve with fresh clotted cream for a delightful afternoon treat!